Is it possible to clean all upholstery and carpet? Can you clean every kind of upholstery and carpet? No. 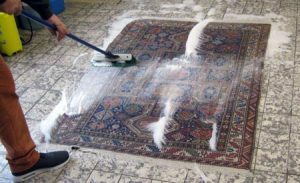 It is not true that you can clean every kind of upholstery and carpet. There are water repellant materials. In theory, these textiles don’t stain, but the practice shows different. However, our cleaning chemicals don’t soak into the carpet, thus making the cleaning impossible. The video below demonstrates the water repellant textile. Can you remove any kind of stain? That’s impossible! If someone claims that he is able to clean any kind of stain, then he is a liar. Or just not an expert in carpet cleaning. The removal of a stain is not hard due to the stain itself, but due to the material of the surface. Natural materials are usually used in upholstery since they don’t fade easily. However, if coffee is spilled on it, then that very stain won’t fade easily as well. We even try the impossible, but we can’t make wonders. There was a case where a bed was outside on the terrace, where dogs and cats slept. Guess how that looked… The owner decided that he wants it back for sleeping, so he wanted us to clean it, but make it look new! We didn’t take it. There was also a case where a man used to eat and drink at a certain part of the carpet. But luckily this doesn’t happen regularly. Most of the problems arise when the housewife thinks she’ll do it the way it’s in the commercials, this way costs less. She goes to the shop, buys the newest “wonder cleaner” and starts to scour it. A few hours later when she gets tired, she realizes that the stain is still there and calls us. But unfortunately, she had already initiated one or more chemical reactions. This could also change the stain’s color.